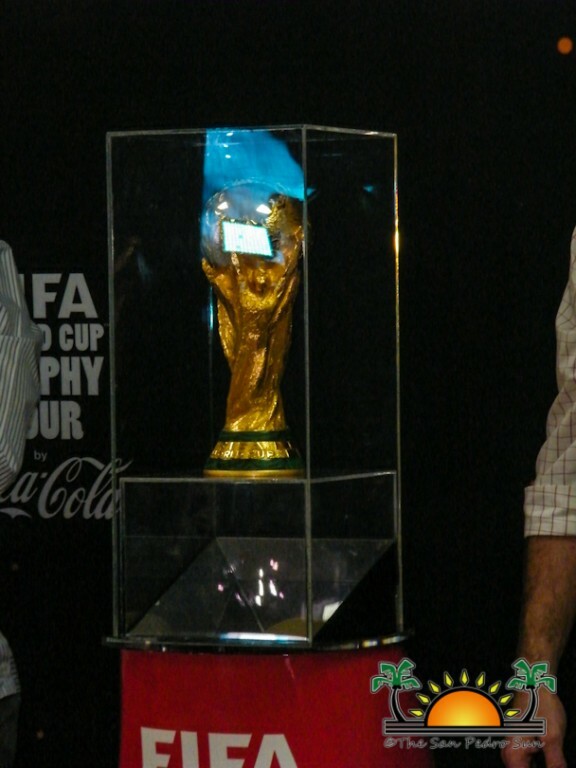 Belize is not going to the 2014 World Cup in Brazil, but that is not stopping Belizeans from enjoying the opportunity of having the most prized World Cup Trophy brought to the country - at least for one day. The most coveted sports trophy worldwide arrived today shortly after 9AM at Belize Philip SW Goldson International Airport. 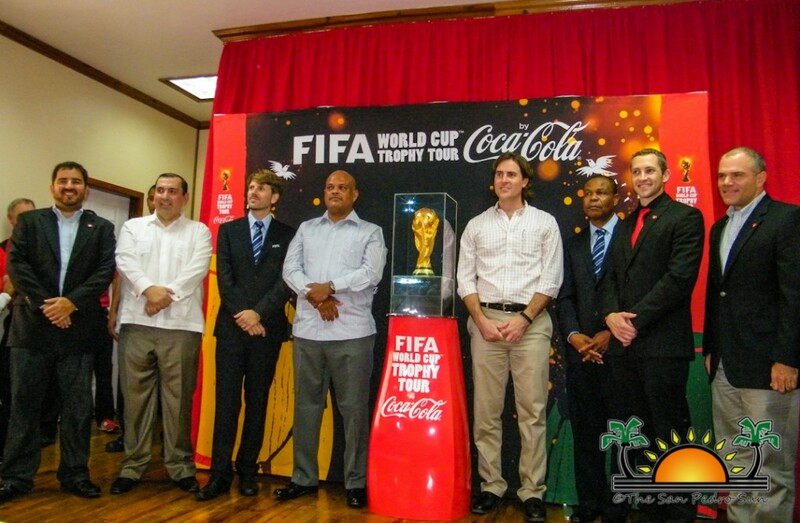 The stopover in Belize is part of a world tour of the Cup sponsored by Coca Cola. It is a historic stop and for Belize, a developing country with no World Cup experience, it is the closest Belizeans will ever experience, at least for the immediate future, of having the trophy in the country. As such, the tour has brought much anticipated excitement not only for the local owners of the Coca Cola franchise, Bowen and Bowen Company Limited, but also for football fanatics and indeed, the entire nation. 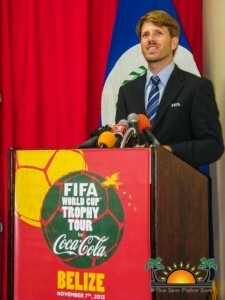 The Tour was developed through an exclusive partnership between FIFA and Coca-Cola, one of the international football organizer’s longest-standing corporate partners. During the third international tour, which was launched on October 12th in Rio de Janeiro, Brazil, the Cup will visit 88 countries over a course of nine months. Earlier in October, during the launching of the promotion in Belize, Bowen and Bowen Limited said that the stop in Belize was one of 50 new countries that have come onboard this tour. 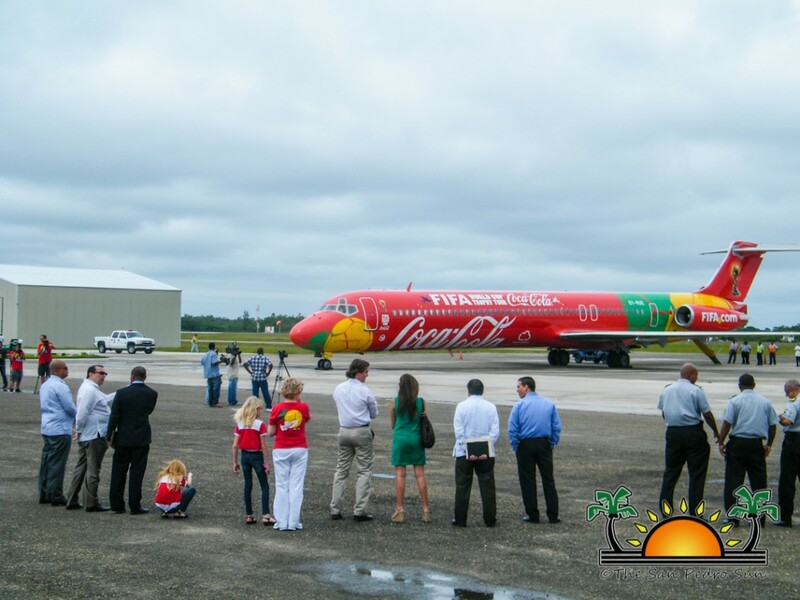 “The stop in Belize is huge because it is one of the largest events for Coca-Cola. It is also the last stop of 39 countries in the region. 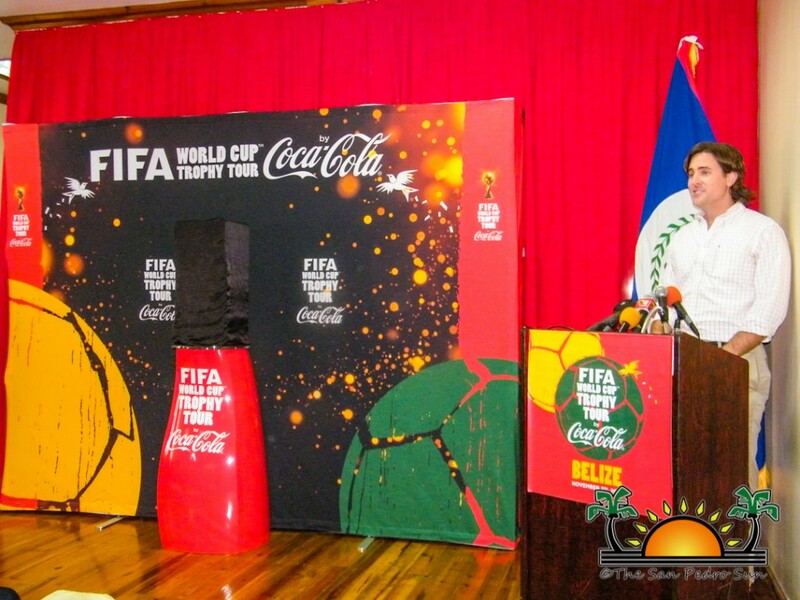 It will surely put Belize ahead in terms of tourism, globally,” said a Coca-Cola representative in Belize. The trophy came onboard a private Coca-Cola Jet from El Salvador, a short 47 minutes flyover to Belize where it will remain for 24 hours. Speaking at a press conference at the airport shortly after the plane touched down, Belize Football Federation President Ruperto Vicente said the stop in Belize is timely. 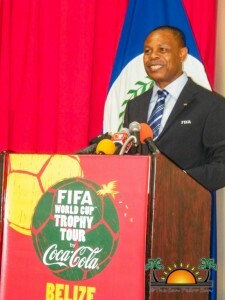 “We are very happy that FIFA was able to bring the trophy to Belize and bring excitement to our country. This visit is timely since we are developing and improving our sports in Belize. Football is on the rise and football is about achieving great things in this country. 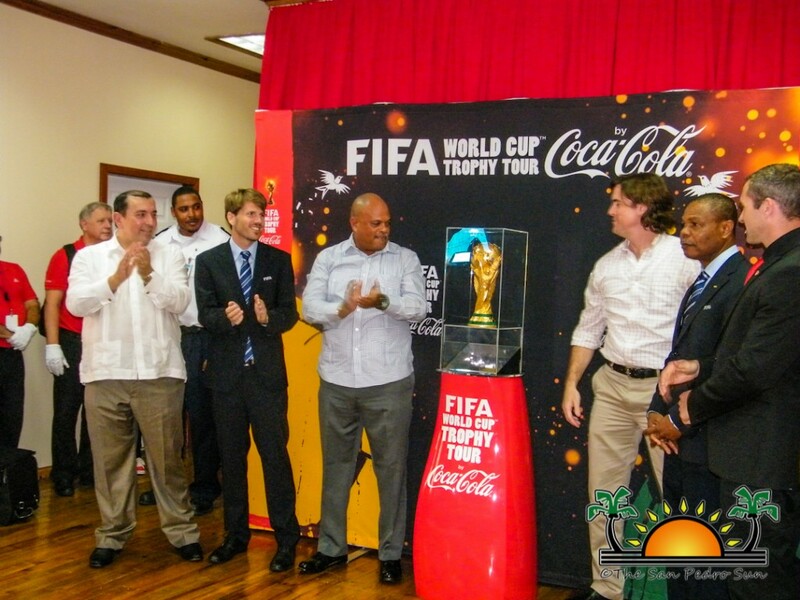 This trophy will only add more excitement to what we are doing with football in Belize. It's an award that every Federation dreams of bringing home and I must say that in 2022, Belize will be going for this trophy at the World Cup,” said Vicente. 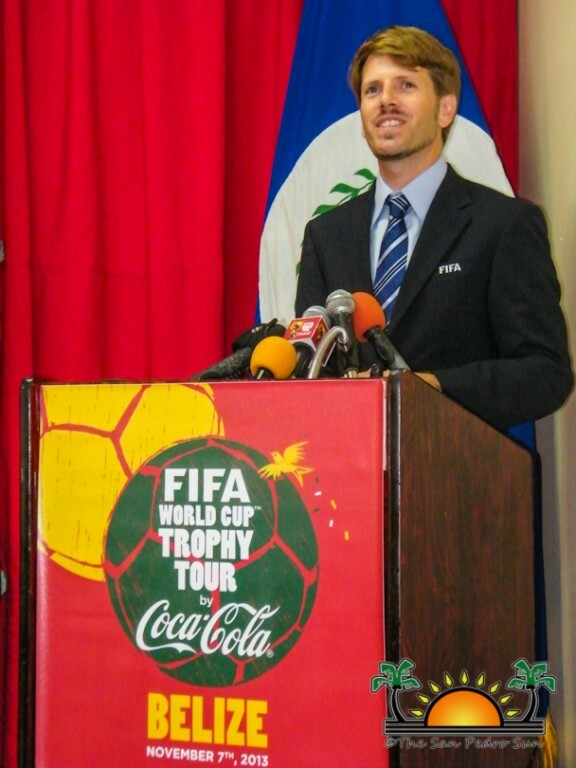 Bowen and Bowen President and CEO, Michael Bowen told the press that local Coca-Cola representatives are happy to host such a prestigious trophy. “We are very excited, and I am speaking for all Belizean, that we are happy to also share the World Cup feeling. This is one way that sports can reach out and touch families.” Brad Ross, Coca-Cola International representative is also on the world tour. The trophy will be hosted at the Radisson Fort George Hotel for a consumer event where members of the Belizean public will have the once-in-a-life-time experience to take pictures with the trophy. 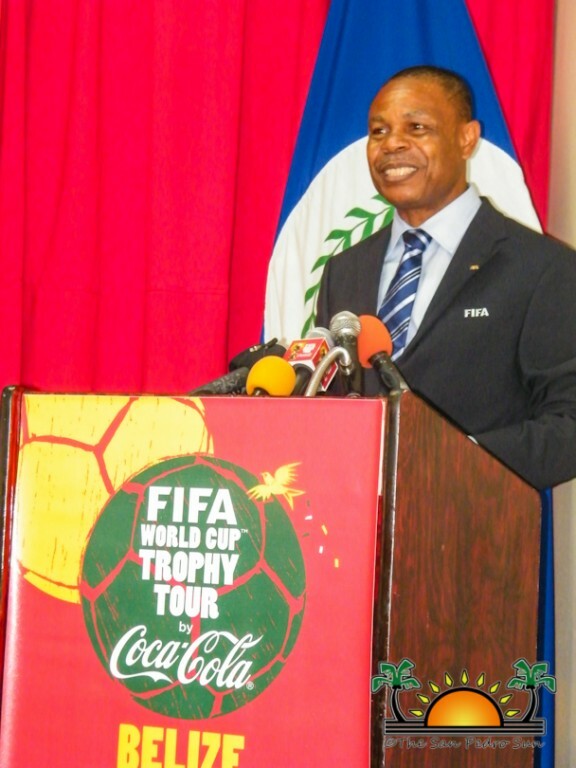 Later in the night, an official ceremony will take place on the hotel’s grounds where Belize’s Head of State, Governor General Sir Colville Young will be the only Belizean to touch the trophy. 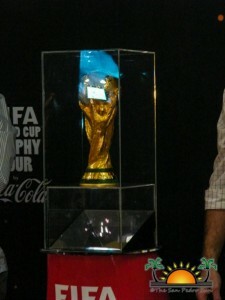 This is the third time that the original FIFA World Cup Trophy is touring the world. The first tour was in 2006 and the unprecedented tour visited 31 cities in 28 countries over a three-month period. On the second occasion the tour visited 84 countries and 130 cities around the world, including 50 African nations in order to celebrate the first ever FIFA World Cup on African soil. 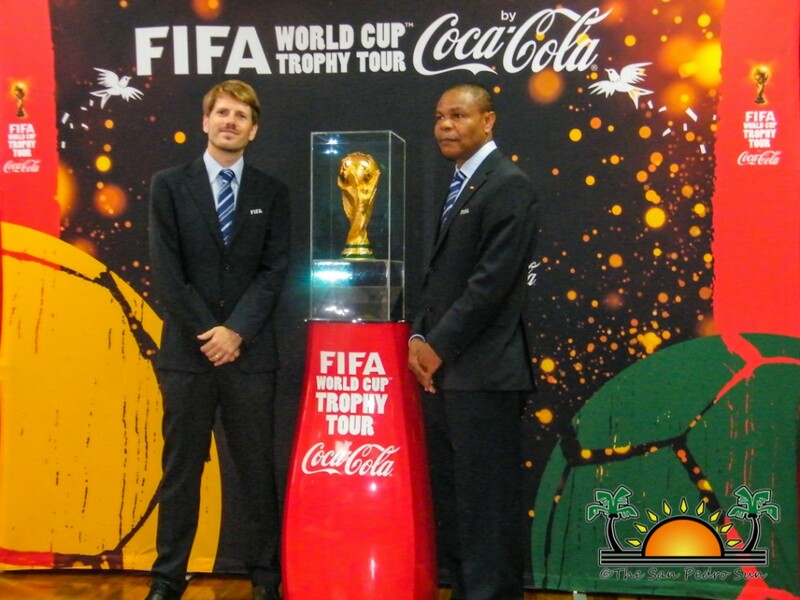 The 2013/2014 Trophy Tour will visit 88 countries during a 267-day duration and Belize is the last stop in North and Latin America before leaving to Europe and returning to Brazil ahead of the 2014 World Cup. The San Pedro Sun will have more coverage of the tour’s stop in Belize as our Senior Reporter Jorge Aldana will be following the trophy during its stay in country. Honduras qualifies for the World Cup! !